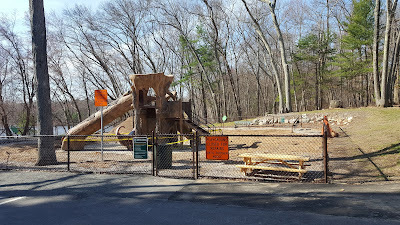 Franklin Matters: "the contractor has agreed to cover the costs associated with the replacement"
"the contractor has agreed to cover the costs associated with the replacement"
"The town removed the equipment at the popular DelCarte playground this week, with hopes of replacing it shortly. Local officials announced in early March that they would be removing the playground equipment at the 136-acre DelCarte Recreation & Conservation Area because of continued integrity problems with the fiberglass-reinforced structure. Recreation Director Ryan Jette said the contractor, GameTime, completed the equipment removal on Wednesday, and completed excavations in preparation for installing the new playground."